Twelve Coachella Valley nonprofit organizations will be selected to receive $25,000 each from the H.N. and Frances C. Berger Foundation. Applications are available through September 30, 2016 for the 2017 Coachella Valley Spotlight awards. All Coachella Valley based nonprofit 501(c)3 organizations that have not previously received the Coachella Valley Spotlight are eligible to apply. Since the program began in 2008, over $2 million in grants have been awarded to more than 80 local nonprofit organizations. The grantees will be selected by the CBS Local 2 Community Advisory Board, which includes representatives from the H.N. and Frances C. Berger Foundation and members of the community. 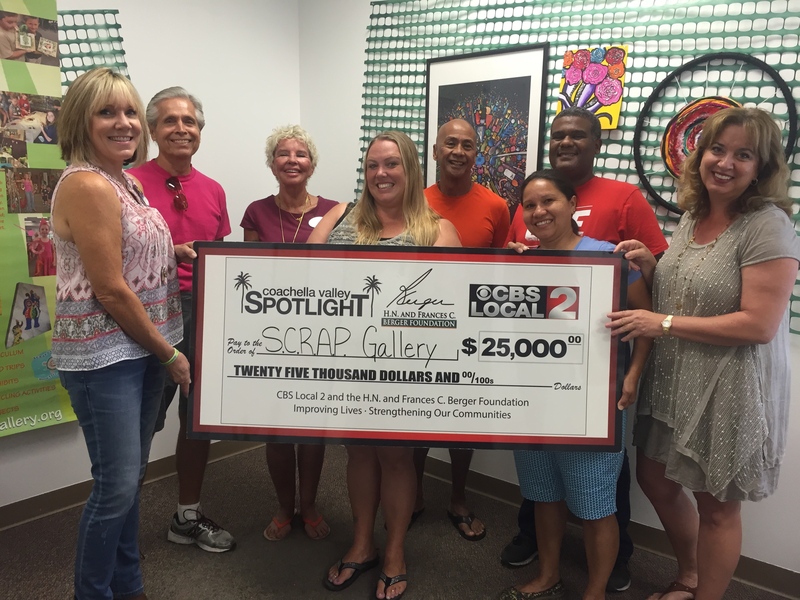 Twelve recipients are selected, and then one is recognized each month during 2017 on CBS Local 2’s Eye on the Desert, as well as in public service announcements and on the station’s website, www.cbslocal2.com. Coachella Valley Spotlight applications are available at www.cbslocal2.com and must be postmarked by Friday, September 30, 2016. Recipients will be notified in December. For more information call 760-773-0342. Small groups of elementary and high school students are expected to tackle big environmental issues next school year, thanks to a $25,000 grant from the H.N. and Frances C. Berger Foundation. The Student Creative Recycle Art Program (S.C.R.A.P.) Gallery plans to use the Coachella Valley Spotlight grant to develop “Kids Green Teams” at local schools, libraries and other community organizations throughout valley. These student teams will develop a project focus for the school year, such as establishing a campus recycling program, auditing water use and waste, or creating a nature area. The S.C.R.A.P. Gallery staff and volunteers will help each team develop goals, a timeline, and a plan to accomplish the project. Additional aspects of each school’s project may include inspiring other students to get involved, fundraising to support their project or making community presentations about their progress. Founded in 1997, the S.C.R.A.P. Gallery is a unique environmental art museum and engaging mobile program that delivers art and environmental education to children throughout the Coachella Valley. By using donated discarded materials, students of all ages learn about conservation, reuse and other environmental issues through hands-on exploration. Since its inception, more than 75,000 pounds of trash have been diverted from the landfill through the S.C.R.A.P. Gallery’s programs. “The S.C.R.A.P. Gallery’s programs actively engage young people to be stewards of their environment, helping to improve our valley’s communities for all generations,” said Catharine Reed, Program Director for the H.N. and Frances C. Berger Foundation. “The S.C.R.A.P. Gallery gives the kids the tools, but the ideas and creations they have are their own. They are innovative, and it’s inspiring to see,” said Mike Stutz, General Manager of Gulf California Broadcast Company, which owns and operates CBS Local 2. Along with the grant, the S.C.R.A.P. 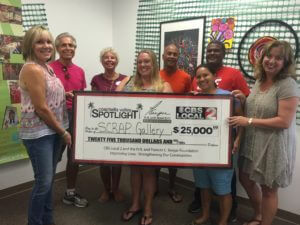 Gallery was featured on CBS Local 2’s “Eye on the Desert,” in public service announcements and on the www.cbslocal2.com website throughout the month of July. To learn more about the S.C.R.A.P. Gallery call 760-861-6479 or go to www.scrapgallery.org. The H.N. and Frances C. Berger Foundation is offering aid after the tragic mass shooting in Orlando through a commitment of a $250,000 matching grant to the Orlando Health Foundation. The nonprofit raises financial support and awareness for the Level One Trauma Center at Orlando Regional Medical Center (ORMC), which cared for victims of the June 12 mass shooting. The Berger Foundation has contributed to the Orlando Health Foundation since 2008, giving primarily to the specialized pediatric and neonatal units at Arnold Palmer Hospital for Children, which is also part of Orlando Health, a private, not-for-profit healthcare network. The Trauma Center at ORMC saw 44 victims on June 12 and performed 26 surgeries on that day alone. To date, the Trauma Center has performed more than 60 surgeries related to the shooting. Four inpatients remain at ORMC. In typical situations, the Trauma Center has 15-20 medical professionals and specialized equipment ready to begin immediate lifesaving care when a trauma patient arrives. While most trauma patients at ORMC are from car crashes and falls, the trauma team trains for a number of possible scenarios. In the case of the mass shooting, this comprehensive training plus a rapid increase of physicians and staff meant ORMC was equipped to meet the needs of this crisis, which saved lives. Donations to ORMC’s Trauma Center will support the ongoing needs in the wake of this tragedy and will be matched dollar for dollar by the H.N. and Frances C. Berger Foundation up to $250,000 through October 31, 2016. Donations can be made through a secure website: give.orlandohealth.com/ORMC-TraumaOne or by mail to Orlando Health Foundation, 3160 Southgate Commerce Blvd, Suite 50, Orlando, FL 32806. Checks should be made payable to “Orlando Health Foundation.” As a nonprofit corporation, donations to Orlando Health Foundation are tax deductible to the extent allowed by law. For it’s 10th Anniversary, the Art Samson Community Library received a very special gift – a $25,000 Coachella Valley Spotlight grant from the H.N. and Frances C. Berger Foundation. 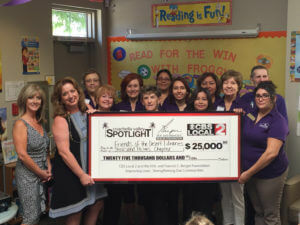 Friends of the Desert Libraries, Thousand Palms Chapter was the latest recipient of the grant awarded each month through a partnership between the Foundation and CBS Local 2. The “Friends” group submits grants and seeks large donations as much as possible, but more commonly relies on membership dues, small gifts, used book sales and other community fundraisers. Riverside County also supports the library, which began with the vision of former Thousand Palms resident Art Samson. Grant funds will be used to purchase technology that library officials say is desperately needed. Items including laptops, tablets, headphones, a television, DVD player and a projector will help the library stay current with the educational offerings of the 21st century. The gift will also allow the library to present more community programs to the people it serves, from infants to the elderly. “It’s great to see the Art Samson Community Library diversify and use this grant to increase available technology and add valuable community programs,” said Mike Stutz, General Manager of Gulf California Broadcast Company, which owns and operates CBS Local 2.